The standard cut for the feathered edge of a wiper die. 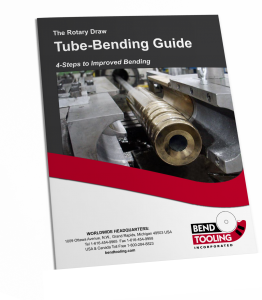 Ideally it is the intersection of the the radius face with the tube cavity of the wiper to fill the gap formed by the trailing sweep of the bend die cavity behind the line of tangency and the back tangent of the tube. Because this results in a feathered of zero thickness, which cannot be reliably machined, in practice the radius face is slightly offset from the tube cavity. The simple-sweep cut is satisfactory for most tube-bending applications which allow the wiper to be raked. However, for high-pressure bends an offset geometry for the feathered edge is preferred, so that the wiper will perform better at zero-rake.